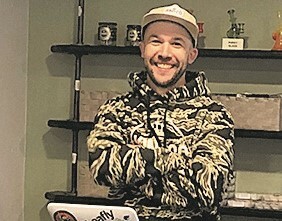 Business Spotlight: Kind & Co.
To achieve this mission, Kind & Co. offers cannabis products, cultivated locally in their state-of-the-art facility. They also provide some of the best concentrates in the greater-Portland area, related merchandise such as Maine-blown glass, clothing hand printed in Portland and edibles prepared by chef, Meghan Newport who earned a degree in baking from The Culinary Institute of America. Upon entering Kind & Co., you’ll feel the homey, down-to-earth and welcoming environment. A factor contributing to Ferri’s complete control of the enterprise is that he is self-funded and has no outside investors pushing for ever higher efficiencies which can result in lower product quality. One of Ferri’s customers, who has rheumatoid arthritis, stated their cannabis-based topical cream was, hands down, the most effective topical she had ever tried. Kind & Co. is located in Windham, on the corner of 302 and Heathwood Drive. You can learn more by visiting their website at www.kindand.co, or calling (207) 572-1086. In recent years, there has been a growth in vacation rental housing due to the popularity of rental listing sites. “It’s like money falling from autumn trees” it has been said about property income and the trendy websites many use to advertise their rentals. However, there are many downsides to doing it all on your own. There are the weekly duties of laundry, cleaning, stocking, key handoffs, pre-stay communication, in-stay responses, calendar management, and the occasional repairs. And that’s just the beginning of managing one’s own rental and/or vacation property. What if you live out of state? Vacation for the self-managed property owner? What vacation? This is where Property Management Inc. of Maine, a newly established franchise property management company located at 5 Whites Bridge Road in Windham, comes to the rescue. Locally and veteran owned by Kurt Griffeth and wife Jackie, the company offers professionally managed rental properties as a smart and worry-free alternative in the greater Sebago Lakes region. 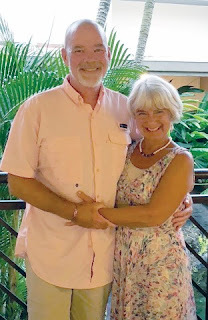 The owners of PMI Maine come with significant experiences that will make a property owner feel confident – trusting the care of their rental homes in the hands of Jackie and Kurt. Jackie is currently a real estate agent and has been working in the field for seven years. She also has 20 plus years of experience in management and customer service. Her friendly “hello” as soon as you walk in the door of PMI Maine will instantly put you at ease. Kurt is a veteran who served in Desert Storm and Iraq and has over 20 years of experience working in utility services, management and customer service. He currently works for On Target Utility Services. Unlike many property management companies where the only service offered is advertisement and reservations while the owner must do the rest - finding their own cleaning company, property repair person and landscaping company, PMI Maine provides it all, including a concierge service. “We can have their groceries delivered and put away as well as accommodating any special events. We can help arrange those special occasions such as birthdays, retirements, etc. We will even order the cake,” Jackie said. PMI Maine also offers marketing that includes worldwide exposure and reliable branding, maintaining an active presence on a wide range of channels, including industry publications and websites, Facebook, Twitter, Google +, as well as hundreds of online travel agencies that broadcast your properties for bookings. In her role in real estate, Jackie has received many accolades on Zillow.com. “Jackie was our Real Estate Agent when we were looking for a house in Maine…she took her personal time to go see houses on our behalf since we lived in North Carolina. We bought our house without having ever walked in. We are forever grateful for Jackie and her patience and diligence.” This individual happily lives in Raymond, Maine. 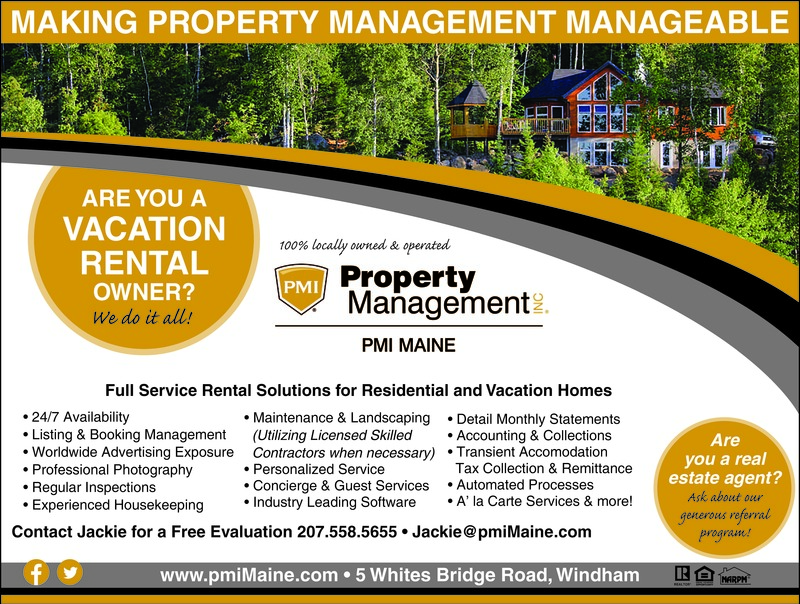 If you currently have a rental vacation property or are considering purchasing income property and would like to know what PMI Maine has to offer, contact Jackie and Kurt at 207-558-5655 or email Jackie@pmiMaine.com. With PMI Maine, you can rake in the money falling off the autumn trees and have freedom, too. Essential oils have become recognized by professionals, as well as the thoughtful consumer, to aid and support healing on physical, emotional and spiritual levels. Specializing in USDA approved organic, pure and fair-trade ingredients, Siochanta (pronounced she-HON-ta) Farm, LLC located in Windham has the mission of creating products that are pure and natural – from the moment the product is planted in the ground to the moment it arrives in your hands. “We provide – to the best of our ability – products that are made locally or in the United States and are USDA approved to be organic, pure and sustainably sourced,” explained Suzy Palmer, co-owner. For many years, Suzy has believed in the “power of nature” and the need for chemical-free, essential oil-based fragrances and skin care products. Suzy, who retired in June 2018 after teaching third and fourth grades for 27 years, could not retire from learning, growing and living life fully. As a result, she and her husband David, a middle-school science teacher and co-owner, established Siochanta Farm in January 2019. Suzy decided to live her life passion surrounding the beneficial properties of essential oils. Essential oils are known to relieve stress, exfoliate impurities, assist in the healing of the muscular, circulatory, endocrine, respiratory and immune systems. According to an online article from Ohio State University’s Wexner Medical Center, “Essential oils are a fantastic way to help with myriad issues such as sleeplessness, nausea, anxiety, allergies and pain,” stated Michele Mack, LMT, CPMT. Suzy explained that it is through education they learned about the importance of using oils that are certified pure, therapeutic grade and the truth about the marketing strategies. “There is no governing body in the U.S. that regulates the effectiveness, quality or purity of the oils,” she explained. The Palmers are so thoughtful in their business, that they carefully source everything from the ingredients to the paper bags and twine. “When I am asked to make a product sample basket for an individual or create a product, it is important that I think about the individual or the use of the product as I am working. I want to make sure that all products are created with a personal touch. That’s how much I believe in the healing powers of essential oils.” Suzy explained. The word, “Siochanta, means “peaceful” in Gaelic. There is no denying that the scent and/or use of essential oils can offer emotional and healing support. “It can relieve the intense stress we all experience in our everyday lives,” Suzy said. “It is my hope that my products can be used during the day – taking a 30 second breather, reminding us to stop and “smell the roses” for just a short while – enough to move on throughout our demanding day, creating - if only for a moment - a sense of peace,” Suzy said. To purchase everything from the variety of gift baskets, to sugar scrubs, roll-on blends, hand sanitizers, lip balm, body wash, lotion bars to gift certificates and more visit their website at www.siochantafarm.com. You will also find Suzy and David at the Windham Farmers Market this summer, located at Turning Leaf Drive beginning May 25th – every Saturday from 8:30 a.m. to 12:30 p.m. until October 14. The door was slightly ajar as if to welcome my presence. As I entered Willow Tree Primitive Shop, a new home décor gift shop that provides multiple selections of early period decorating furnishings, keepsakes and relics at 6 Sabbady Point Road in Windham, I was greeted with a kind smile by co-owner, Carrie Perry. Perry and Webb, purchased Willow Tree Primitives in November of 2018, which was a gift shop originally established in Lewiston. 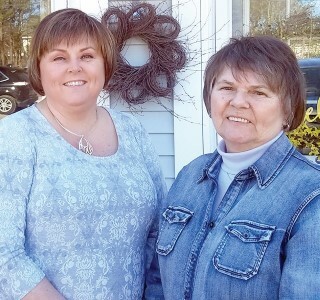 After the purchase, the new owners moved the business to Windham, where Perry resides. They officially opened their doors on December 6, 2018. Webb and Perry are in the process of changing the name slightly to Willow Tree Primitive Shop. The road to primitive home décor collections comes from a passion to discover personal home adornment preferences. “For the longest time, I was trying to find my own way in personal home decoration,” explained Webb. “I decorated in French Country, but decided that did not suit me. I enjoyed Home Interior for a while until I came across the Country Peddler in the mid-1990s and I discovered I enjoyed decorating my home in the rustic style, it was more of a fit for me” she laughed. You will find many locally Maine made and handmade items at Willow Tree Primitive Shop. “We have local artists from Maine who supply our shop with many gifts and decorations such as signage, candles, artwork/prints, and dolls,” stated Perry. Also available, are Willow Tree figurines and locally produced raw honey, soaps and lip balm. Although only open for the past three months, they are honored by the many customers who enjoy having this primitive gift shop in the area. “We felt so welcomed from the minute we entered. They have a great variety of things. Great to have a nice shop in the area if you need a nice gift,” stated a recent customer, Donna Harrington. 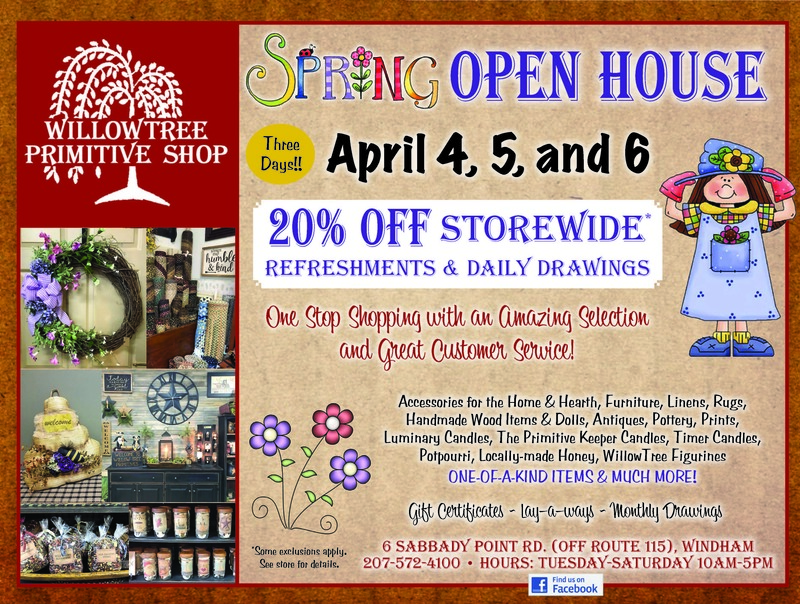 Be sure to visit Willow Tree Primitive Shop at their three-day open house on Thursday through Saturday, April 4, 5, and 6 from 10 a.m. to 5 p.m. Be sure to follow their Facebook page for the latest announcements. For more information, contact Perry or Webb at (207) 572-4100.
overwhelming project that comes with many sleepless nights and a lot of anxiety. Whether you are updating your kitchen, bathroom, roof or simply repainting the exterior of your house, there are so many options available. It’s difficult to know where to begin to make the perfect choice for what you envision. That’s where the friendly experts of House to Home by Chick Lumber at 625 Roosevelt Trail in Windham come in and save the day. Chick Lumber was originally established in New Hampshire in 1870 with the present outdoor lumber yard located at 209 Hobs Street in Conway. Moving forward 143 years, the present Chick Lumber company was purchased by Sal and Jackie Massa in 2013, creating the House to Home showroom as an addition to their list of services. The North Conway showroom location is at 1618 White Mountain Highway. Jackie Massa has a degree in Residential Design. Whether it is new construction or a remodel, Jackie will be with you every step of the way putting the homeowner at ease. Jackie makes sure that the process of making your house into a home is as stress free as possible. What sets Jackie apart is her ability to take into consideration what her customers want while incorporating style, quality, function, and infusion of the space with warmth and most importantly, a sense of home. Jackie has always had a natural talent for colors, but she wanted to take it one step further by becoming a Certified Color Expert. With this additional certificate under her belt, she now offers home color consultations using Benjamin Moore’s enticing colors. As for the rest of her staff, Jackie stated she has a lot of confidence and trusts their expert abilities. In addition to the Massa’s, Shea and Harmon, the other team members and specialists you will find in the Windham House to Home Showroom includes: Kat Milvo, professional designer; Stephen Roberge; paint specialists, and Ryan Gleason, millwork and outside sales. 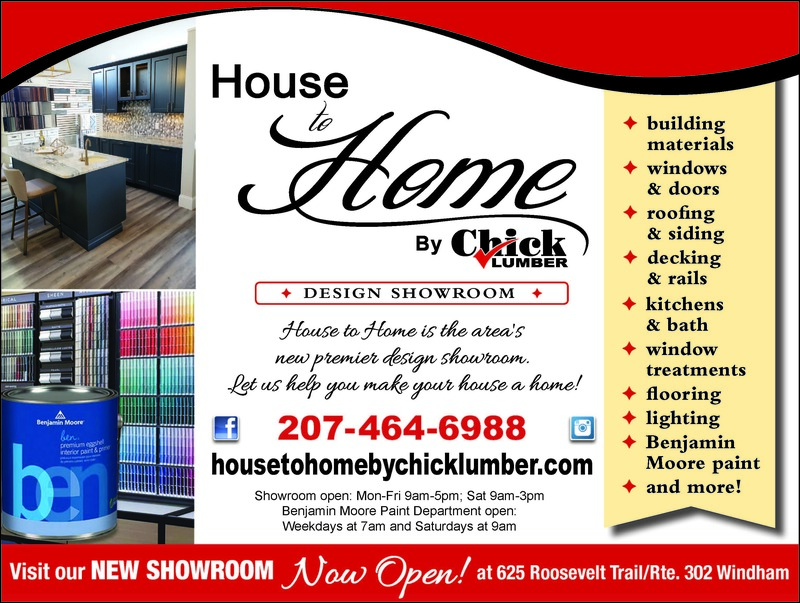 At House to Home by Chick Lumber, the one stop shopping services provided include the following: Kitchens/bath, flooring, window treatments, lighting/fans, windows, doors, siding, roofing, Benjamin Moore Paints and decorative hardware and more. Many people who experience pain in their hips, knees, shoulders, elbows, and feet will frequently end up with surgery. Most people do not realize; however, they have alternative treatment available to them now in the exciting world of stem cell regeneration. Dr John Herzog, a Raymond resident just may have the answer for you. Dr. Herzog’ is a board-certified orthopedic surgeon with 40 years’ experience. He’s performed over 10,000 surgeries - everything from replacing knees hips and shoulders to reconstructing trauma victims. For the past 10 years he has focused exclusively on regenerating torn and degenerating tissues and joints with advanced stem cell procedures. Herzog’ says the basic problem is that when joints start to degenerate, or rotator cuff begins to tear is that there is poor or no blood supply to the area that’s damaged. The beauty of using own body, is that it produces its own custom compounding pharmacy, otherwise known as your own stem cells. This process is much like robbing Peter to pay Paul by generating new blood supply. For example, in plantar fasciitis or tennis elbow the blood supply is very poor in this region of your body and cannot get the nutrients, oxygen or stem cells that it takes to repair it. What the doctor does is essentially taking stem cells from your blood, your bone marrow, or your fat and - with a centrifuge process that purifies the blood supply, separately stem cells and platelets. Once it is purified and separated, it is injected into the area where the pain persists. This regrows the blood vessels and creates a new irrigation system to repair tissue naturally. Aging and disease are a result of poor blood supply. Dr. Herzog is a third-generation osteopathic physician which he states with great pride. “As an osteopath, you are a holistic doctor,” he stated. “We know how to use a knife, medicines, and our hands to improve their patients’ lives.” Utilizing osteopathic manipulation is also an important part of Dr. Herzog’s successful formula. 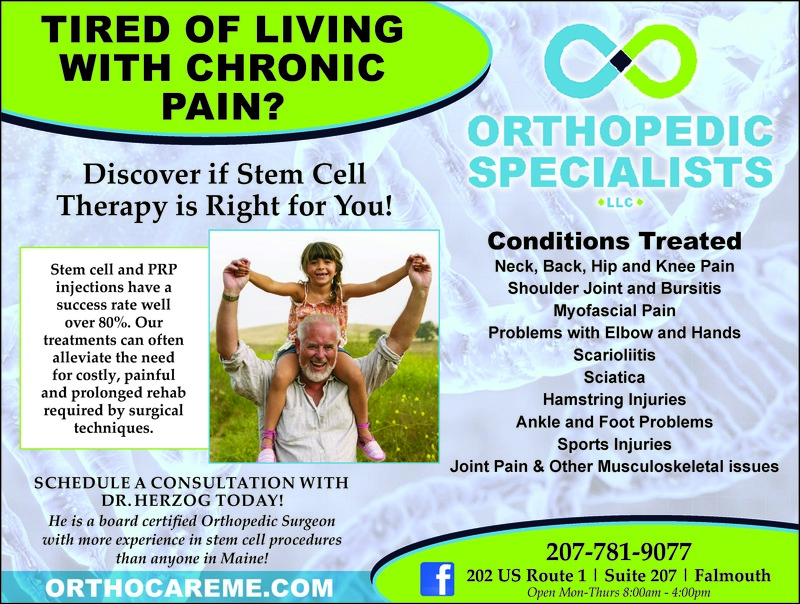 If you are experiencing pain and want to learn more this cutting-edge medical alternative, contact Dr. Herzog at 207-781-9077 or peruse his website at/www.orthocareme.com. Most insurance policies are accepted. 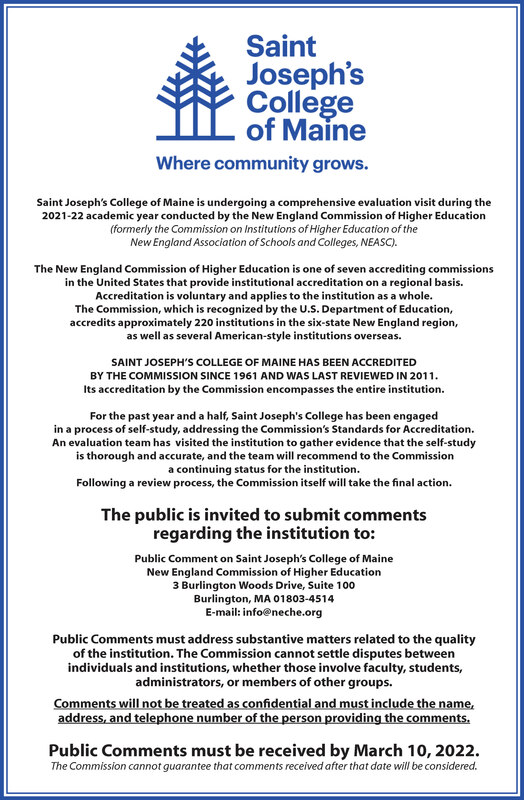 We both laughed but the truth is, there is a lot of unknown opportunities for fitness, growth, and lifelong learning at Saint Joseph’s College available to all residents of the Lakes Region communities, young and old alike. Many people in the area are unaware of the multifaceted options available at Saint Joseph’s that are accessible at a very low rate or at no cost at all. Additionally, SilverSneakers is part of a new initiative at the college. Peter Nielsen, Entrepreneur-in-Residence at Saint Joseph’s, explained that the college is developing several programs designed to support older adults as the college establishes the Institute for Integrative Aging, a center for research, education, and community-centered care for older adults. 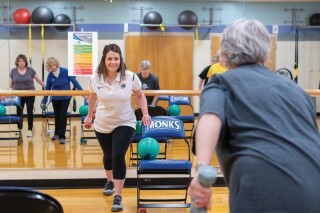 Integrative aging—a term coined by Saint Joseph’s College President Jim Dlugos—seeks to advance the concepts of integrative medicine and healthcare to develop an understanding and approach to aging which recognizes the multi-dimensional aspects of aging. SilverSneakers participant, Kimberly Cross concurred with Chase. "I have arthritis in my shoulder, and finally I have exercises I can do,” she said. That’s what makes SilverSneakers so unique. Participants forget they are working out because they are having so much fun. "It is so much better than just using equipment in a gym full of strangers. An engaged group following an enthusiastic leader is so much more encouraging," stated another SilverSneakers participant, Kathie Bickford. When asked if Chase knew Diana Ross, she responded, “I think I may have heard of her” and thus, multigenerational and integrative learning at its best. If you are interested in learning more about SilverSneakers, join in on the Launch Week for free to experience the classes for yourself. Join in all or one of the following sessions: Tuesday, March 12, Thursday, March 14 and Friday, March 15. All classes begin at 11 a.m. and will include a tour of the fitness facility, healthy snacks and beverages, as well as a tour of the café on campus. Whether it’s exercise, fun, food or social activities you are looking for, you will find it at Saint Joseph’s College of Maine, 278 Whites Bridge Road in Standish. You will definitely find the hidden indoor “gym” (aka, indoor track) located on the second floor that is available for all Lakes Region residents for free. And perhaps you’ll discover a hidden gem that will meet all your needs, right here in your own backyard.